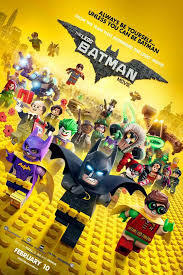 The LEGO Batman Movie is the spin off from the original LEGO Movie it stars Will Arnett as Batman and co-stars Channing Tatum, Rosario Dawson and Jonah Hill. This is my movie review! Batman is a crime fighting machine by night but lonesome bachelor by day, the LEGO Batman movie explores this side of him and his transition into family man all while trying to capture Gothams darkest criminals. The LEGO Batman movie does well but falls a bit short of its predecessor The Lego Movie. It just doesn't have the magic of the first and scaling up the Batman cameos to a full film just didn't work for me. Bane was brilliant again as a cameo in this film and it was great to see the whole DC comic book universe represented in this film. I found The LEGO Batman movie somewhat boring in parts and the forced humour did grate on me in the end.